The rich waters making up the Emerald Seas of the Pacific Northwest contain some of the best diving in the world. The cold water coming down out of Alaska and British Columbia flow in and out twice a day with the tide, providing nutrients, oxygen and food for the abundant numbers of creatures found beneath the surface of the water. Diving these cold waters takes a bit more gear, training and gumption, but the rewards are incredible. Every square inch of many dive sites are completely covered with colorful critters that simply defy description. Many of the best sites are easily accessible from shore, and are quite close to large urban populations. Amazing Giant Pacific Octopus are common , along with friendly wolf eels. Prehistoric Sixgill sharks lurk in the dark depths right below many of Seattle's piers. Colorful sponges, soft corals, anemones and fish greet you on nearly every dive. If you do get the chance to "get wet" and explore the Emerald Seas, by all means do so, you will be amazed at what you find. 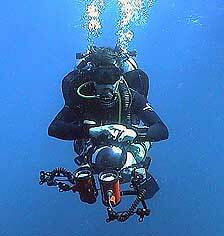 One of the most common questions I get about diving is, "how did you get started diving?" Well, it went something like this, we were making plans for our second honeymoon, and we remembered how much we enjoyed snorkeling around the resort. Somehow, we thought that rather than just snorkeling and looking at everything from the surface, that we'd enjoy diving and getting "under" the water even better. So, almost on a lark, we decided to get certified before we left on our vacation. I called a friend, that was a very experienced diver, and asked where would be the "safest" place to get certified. He told us to call Craig Brown at Capital Divers, and sign up for our Open Water course. Our initial plan was to do the course and pool work in the Puget Sound, and then do the open water referral dives in Kona (warm water). However, after completing the course and pool work, we decided to go ahead finish the open water dives in thet Sound (just to get it over with). The first 4 Open Water dives were dark, cold and a bit scary! It makes me laugh now just thinking about how anxious and nervous we were. After our certification dives, we were both thinking you'd have to be crazy to want to dive in this cold water. The next day, we flew off to the Kona Village Resort in Hawaii for some wonderful warm water diving. We approached the dive operator with our "temporary C cards" (the ink was still wet, and we could see the look of horror on his face) and said we wanted to go diving, "but we were just certified yesterday." With barely a shiver of his back, he asked where we were certified, to which we replied, "Seattle, Washington". Then we saw the big warm smile as he remarked, "Oh, you're cold-water divers, no problem!" We had a great time! We were pretty convinced that we'd be sticking with warm water diving, but when we returned to the Pacific Northwest, we decided it would be best to keep our skills sharp by continuing to dive locally. Since that time, we have discovered a wonderful and tremendously rewarding underwater world around Puget Sound, Hood Canal, the Straight of Juan de Fuca and up into British Columbia, Canada. I think you could safely say we're hooked! We also try to escape to warmer waters at least once a year, and have managed to escape for 2 trips to Cozumel, a trip to Bonaire , a live-aboard trip to Belize , a live-aboard trip to the Galapagos, and even Cavern diving in Akumal Mexico. We also make several trips each year up to Canada, to dive in the lush clear waters off Vancouver Island. Jacques Cousteau was almost right when he referred to those waters as the second-best diving in the world! After each trip abroad, we come back and are always amazed at how lucky we are to live and dive in the lush green waters of the Evergreen State. I personally believe this is the best place in the world to dive, if you can stand the Cold! If you are an active diver, I HIGHLY recommend that you read THE LAST DIVE, it really is a great book, that is extremely well written, and both Janet and I had a hard time putting it down. It will change the way you dive and may make you realize that it can happen to you! Shadow Divers is an even better book about John and Ritchie's exploits identifying the U-who submarine. Also, if you want to keep in touch with other Northwest Divers, surf on over to the NorthWest Diver Forum and check out the local action. © 2018 Emerald Sea Scuba,LLC. All Rights Reserved.